Wiglaf shows amazing restraint when Mordred snatches his book. XD I guess Wonderland will give you inspiration to travel to new places. 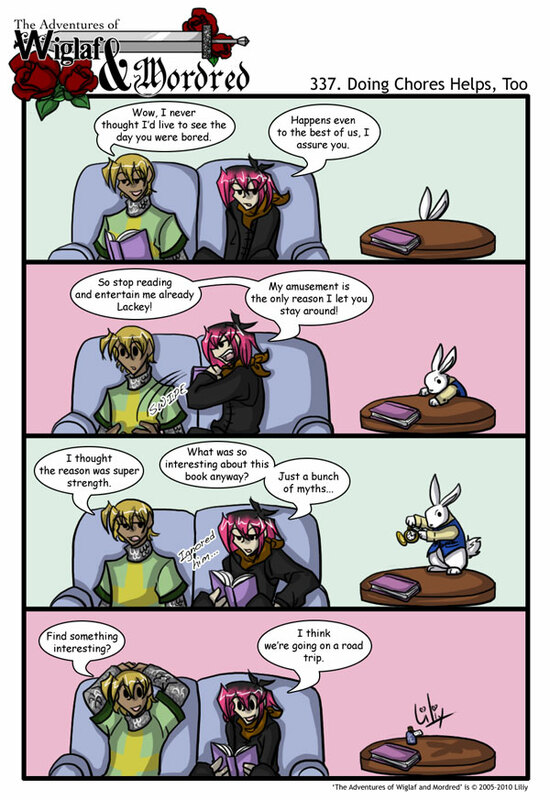 8D The White Rabbit (And other Alice references) is epic. I’m not seeing it. What white rabbit? But gasp! I have something to point out as a potential flaw – in panel 2, the first (left) speech bubble appears to be coming from Wiglaf, and not from Mordred (who said it?). I would assume that Wiglaf would not make a statement like that for no reason, calling Mordred a Lackey, unless he was imitating him, in which cause quotes would be around it. I would suggested changing it so both bubbles are connected in that panel. It’s not a huge deal, but if someone was tired or not paying too much attention, they could get temporarily confused. Road trip down the rabbit hole! Don’t be late! PS: Is it bad that I’ve already seen Alice in Wonderland twice? Great comic! Galen’s cast page is indeed kickass. Woooooooot Road Trip! New plot arc? Plus also: you linked to tvtropes. Now I will never be free. Hmm.. a Mordred planned road trip? This.. could be interesting. Or terrifying! One of the two! I am going to miss Mordred’s pink hair… maybe he’ll do something silly to Wiglaf again and it will get redyed! By the by, if you can (its annoyingly hard to hunt down) you should listen to The Rabbit by Mike Snow. Great song! All this rabbit talk and Oryctolagus Cuniculus talk is very confusing. Did Liliy’s commentators get together and decide to punk her in honor of Alice in Wonderland?? If so you left me off the list. Yes I do~ Well. If I didn’t play it I watched my brother play so all together, sure. XD I love them. why is the couch a different colour? oh really? i thought it was like the horse of a different color from wizard of oz just the couch of a different color ya know?